I have been constructing Log Cabins for more than 40 years, in Britain and Ireland. The buildings vary from one of the largest log buildings in Europe for the Wildfowl Trust at Martin Mere in Lancashire, to the smallest - ski club huts at Glenshee, Perthshire. Sites have ranged from the remote west coast of Scotland to the city streets of London, and they blend in equally well in either situation. Buildings are individually designed to suit both client and site. Most buildings are permanent homes, but also club, recreation and holiday buildings. Anyone wishing a log home should visit as many different log buildings as possible - old and new - and if possible discuss any problems there may be with log home owners. 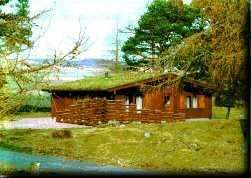 The rest of this website has more information on the log buildings, and examples of log cabin floor plans and costings. If none of these are suitable, you can send me a sketch with dimensions of the layout you wish and I will send back a plan with costing. If you have any questions, please do not hesitate to contact us. There is a selection of log cabins here in Kirkmichael, which we would be pleased to show anyone interested. Please phone to arrange a suitable time.